There’s no longer an excuse for marketers who uncover a high potential opportunity only to see a competitor exploit it first, writes Nikki Davey in this exclusive article published in Marketing magazine. The marketplace is rapidly evolving, channel choices are being disrupted and categories continue to fragment, providing consumers with more and more choices and making it harder than ever to compete. We’re currently on the eve of the fourth industrial revolution, where digital touch points reign supreme – social media and digital are changing the way consumers learn, and the ways they are influenced to try new things and adopt new behaviours. Now brands are expected to innovate faster than ever to keep pace with the rapidly-evolving marketplace. But more often than not, marketers either take too long to bring new products to market, allowing competitors to reap the benefits of first-mover advantage, or move too quickly, sacrificing quality for speed and rushing to market with a less than optimal offer that fails in the first year. Admittedly, finding and launching successful new products into the market quickly is not easy – there are hurdles to overcome to break away from the pack – but this doesn’t mean it can’t be done. Having worked with brands to bring the traditional idea generation and concept development cycle time down to just seven days, here are a few strategies that work. There exists an inherent fear in corporations that moving too fast can lead to mistakes. There is comfort in slowing down and employing tried and tested processes, ensuring everything is perfectly in check before progressing. Seeking perfection is flawed, however, when it comes to new product development where caution often leads to more complexity than is ideally warranted. Extensive, complicated, prolonged internal and external processes are speed-to-market killers. Traditional research, whilst bringing enormous rigour into the innovation process, is one of the biggest culprits in slowing speed to market. In addition to being time-consuming it is also often not suited for today’s competitive markets and ever-changing consumer behaviour. It can be blunt, inflexible and not iterative enough to allow ideas to realise their full potential. In our new normal, we must deliver on innovation speed without compromising on quality. It requires a fast-turnaround innovation process that identifies great ideas grounded in real consumer insights, and then fast-tracks them, driving them through the innovation process as quickly as possible. To do so, it is vital to bring together the best brains both from within and outside of the organisation to be active participants in the process – including the marketing team, research partners and industry experts, committing to work together in a highly collaborative, intensive and creative engagement over a course of as little as a single week. Employing this team of collaborators ensures a strong internal understanding of the innovation challenge, aligns internal priorities, accelerates the stage-gate process and ensures only the best co-created innovation outcomes. Human needs and motivations do not emerge or thrive in a vacuum – rather, they are influenced by the multiple contexts in which people exist and interact with products and brands. Yet most innovation ideas are identified, designed and tested in ‘theoretical’ ways that do not always reflect people’s real-life contexts. No wonder that eight-out-of-10 new products fail within three years of being launched. Innovation success only comes when speed is underpinned by relevant consumer context. The first task of the collaboration team is therefore to uncover meaningful insights upon which we can ideate, drawing on a variety of facilitation techniques designed to prioritise the most compelling opportunity platforms. Once grounded in a true consumer insight we now look to ideation, coming up with the new product ideas of the future that will solve consumers’ problems of today. This is where many companies turn to crowdsourcing – usually either among their own employees, or customer base – both worthy efforts to be sure, providing us deeper insights into motivations. Though in my experience, these sources rarely generate usable ideas. To truly tap into unchartered creativity, it’s vital to reach outside the company walls into the online world, to tap into the fresh thinking of a wider global community of online creatives responding to a clearly articulated brief. This ensures we ground them in a consumer truth and the process yields meaningful output that is aligned with business strategy. The aim here is to generate fresh new ideas at scale that our team of collaborators can review, theme and build on, unlocking the true power of co-creation. The rate of change related to consumer behaviour, technology and digital communications is only getting faster. It’s critical to be proactively innovating ahead of the rest of the market to keep up. Companies need to quickly find and adopt a new normal that will allow them to succeed in our rapidly changing market. Identify and fast-track the great ideas that will drive incremental growth for your business. The fact is, there is a better way. Disruption is here. 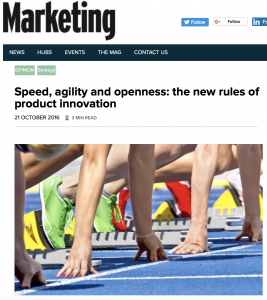 And for the marketers brave enough to take on product innovation with speed, agility and openness, let me welcome you to a world with endless possibilities.